For the garden, from the garden and much more! I'm Deborah Pfeiffer the artist and gardener. Thanks for viewing my website. Please call or email if you have any questions or want to see if an item is still available. If you call, please be sure to leave a message. As you can see, I am usually working in the garden or my studio, and I will call you back as soon as my hands and feet are clean! Thanks so much! 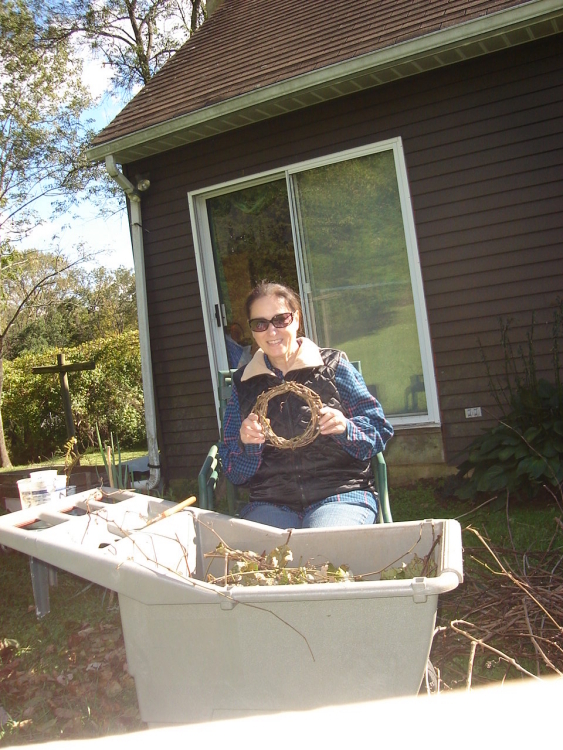 This is a photo of me after making a grapevine wreath. All the vine wreaths I decorate are handmade by me from vines that grow on my property. Also, please be sure to "like" Artistic Botanicals on Facebook. I am a juried artisan and my work is displayed in homes & businesses throughout the country. I have participated in many group exhibitions, including the prestigious Philadelphia Flower Show. I am also a member of the Saucon Valley Art League.